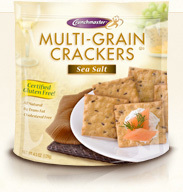 We recently tried the Crunchmaster Multi-grain and Multi-seed crackers and they are delicious! 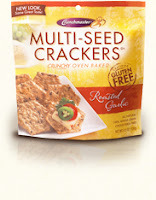 If you're looking for a new, gluten free alternative to traditional crackers, I highly recommend these. They taste like gourmet crackers, but they're reasonably priced. Sea Salt Multi-Grain Crackers: I love all things sea salt, and the Sea Salt Multi-Grain Crackers are seasoned just lightly enough to enjoy the flavor without going overboard. These crackers are all natural, saturated fat free, certified gluten free, cholesterol free, and vegan/dairy free. For as healthy as these crackers are, I was surprised that they tasted so good! Original Multi-Seed Crackers: These crackers are packed with sesame, quinoa, flax, and amaranth seeds, and lightly seasoned with a wheat free tamari soy sauce. 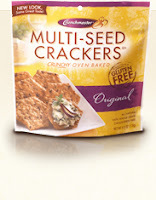 I typically buy a lot of multi-seed breads, but hadn't tried multi-seed crackers before. They are fabulous will definitely be showing up in our house on a regular basis! They are also all natural, 100% whole grain, cholesterol free, certified gluten free, sugar free, and vegan/dairy free. Roasted Garlic Multi-Seed Crackers: Our house is usually stocked with garlic crackers of sorts, so these were immediately a favorite. They are lightly flavored with roasted garlic and to me, they are a great alternative to chips because they are hard to stop eating, but at least they are healthy for you! These crackers are all natural, 100% whole grain, low saturated fat, certified gluten free, cholesterol free, and have 0g of trans fat. Disclaimer: As always, our opinions are our own, honest opinions and may differ from yours. No monetary compensation was given to review these products. I want to try the sea salt! These are still some of my favorite crackers. They're so addictive, but at least they are healthier for us!! :) Thanks for sharing about them.